In 1920 Herbert H. Dow commissioned a series of paintings of Dow Chemical Company at Midland, Michigan, from British artist Arthur Henry Knighton-Hammond. The remaining works, which exemplify the industrial painting genre, were on display from 2000 through 22 June 2004 at the Chemical Heritage Foundation. 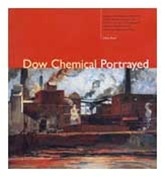 Dow Chemical Portrayed, the catalog, accompanied the exhibit. The full-color plates show how a world-class artist captured Dow Chemical's industrial magnitude on canvas. Some of the sites depicted include interior and exterior views of the caustic pot house, the indigo shed, the Epsom salt plant, and the machine shop. The book also provides an overview of industry in art over the last 250 years and discusses Knighton-Hammond's early life, career, and six-month appointment in Midland.